Tomorrow is Cinco de Mayo, a day filled with food, lots of drinking and overall celebration. At least that’s the way it’ll be celebrated in the United States. What’s that? You thought Cinco de Mayo was a national holiday in Mexico? Sorry, señor. The Fifth of May (which is what Cinco de Mayo means for anyone who slept during Spanish class) commemorates the 1862 Mexican victory over the French in the Battle of Puebla. Cinco de Mayo is not Mexican Independence Day and, except for the Mexican state of Puebla, it is just another day in Mexico. Mama’s mama is Mexican, so I like that Cinco de Mayo has evolved into a celebration of pride and heritage for Mexican Americans (and those Mexicans living here who might not be Americans… yet). One of my favorite dishes to serve on Cinco de Mayo is Chiles Rellenos (which originated in Puebla, Mexico, by the way). But my Chiles Rellenos (which means stuffed chile) are not those deep-fried cheese-oozing chiles you get with the Number 12 Mexican Platter at some restaurants. 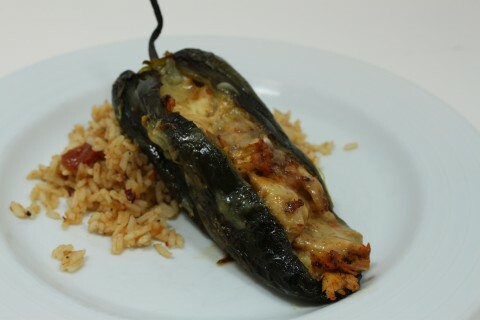 No batter, no deep frying… just delicious seasoned chicken filling stuffed inside the deep earthy goodness of a poblano chile. It’s a lot less fattening. Save the calories for another round of margaritas. Heat the olive oil in a large skillet over medium-high heat for 1 minute. Add the onion, garlic, chili powder and salt and sauté for 1 to 2 minutes or until the onion is thoroughly coated with chili powder. Remove skillet from heat. Add the chicken and stir until mixture is well blended. Place the chilies in a greased oven-proof dish large enough to hold stuffed chilies. Fill each chile with about ¾ cup chicken mixture and about ¼ cup cheese. 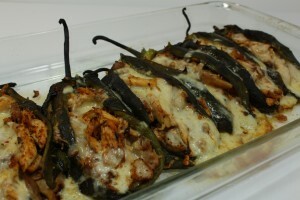 Bake Chiles Rellenos for 15 minutes. Remove from oven and serve with your favorite salsa or guacamole. • There are several methods for removing the tough transparent skin from a green chile. I prefer the oven or broiler method because it is less messy and I can do other things while the chilies blister. 1. Turn oven broiler on or set on High. 2. Carefully make a lengthwise slit in one side of each chile pod.. Remove the seeds and veins (if you want a little heat, skip this step and leave the seeds and veins in the chile). 3. 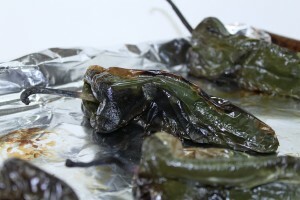 Place the chile on a foil lined baking sheet 3 to 4 inches from the broiler. 4. 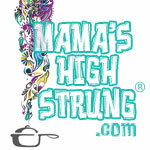 Allow pods to char and blister (this does not mean burned! ); turn until all sides are equally blistered. 5. Remove from oven and wrap in a wet towel to cool. 6. Peel blistered skin downward from the stem. Set aside until ready to use or place in a sealed container and refrigerate.